Dr. McCormick accepts the following list of insurance providers. Select your insurance provider to see more details. I am a radiation oncologist and Chief of the External Beam Radiotherapy Service at Memorial Sloan Kettering in Manhattan. I work as part of a team of specialists from different areas to treat people with breast cancer. We care for about 350 patients each year. With the exception of 18 months in the early 1980s — when I worked at Albert Einstein Hospital to gain experience with breast conservation techniques — I have been at MSK since 1974, when I was a resident. My interest in medicine started at a young age. As a child, I was often sick with infections, and our family doctor would make a house call and put me on antibiotics. I usually felt better very soon and came to respect the healing powers of medicine. In medical school, I did research on childhood leukemia and first learned about radiation as a treatment for cancer. The field is appealing to me because I love math and physics. I am currently researching the effectiveness of radiation versus observation in patients with low-risk ductal carcinoma in situ, a type of noninvasive breast cancer. I have also contributed to a novel treatment for certain elderly women without radiation therapy. In addition, for breast cancer patients, I continue to refine the use of radiation therapy in the prone (face-down) position. This helps improve long-term cosmetic outcomes and protect vital organs like the heart and lungs. My newest research will explore whether breast radiation after surgery has an impact on patients’ tolerance for exercise. Patients arrive in my office with a wide range of knowledge, apprehensions, and expectations about breast cancer. I try very hard to communicate in a way that connects with them. I work to reassure them about therapy by sharing with them the excellent evidence we have from thousands of patients who have taken part in cancer clinical trials. I like to be upbeat and welcoming, as I would be with a visitor to my home. I hope patients leave with a better understanding of their condition and treatment plan. I serve on the breast committee for the National Comprehensive Cancer Network guidelines panel. I am a former chair of the Breast Program Committee for the American Society of Clinical Oncology and former Chairman of the Breast Committee for the Radiation Therapy Oncology Group Cooperative Group. I have served on many consensus panels and have written extensively on both breast and eye cancers. In my spare time, I love needlepoint and knitting, gardening, piano, and traveling with my family. I like to be upbeat and welcoming, as I would be with a visitor to my home. I hope patients leave with a better understanding of their condition and treatment plan. 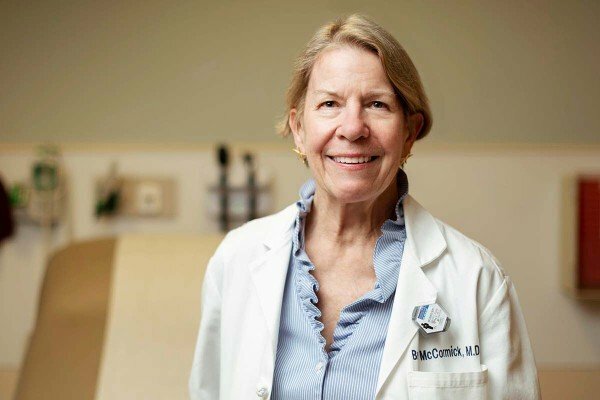 Visit PubMed for a full listing of Dr. McCormick’s journal articles. Pubmed is an online index of research papers and other articles from the US National Library of Medicine and the National Institutes of Health.